Mean values and associated statistics for DOPAC and DA tissue concentrations (pg/mg protein) are presented in Table 2. Two-way ANOVA indicated no significant effects of Treatment Group, Drug, or their interaction on analyte content in the prefrontal cortex. However, a significant Treatment Group X Drug interaction was found for nucleus accumbens DA content. This effect was due to significantly decreased DA content in the E2 group treated with apomorphine when compared to both the E2 group treated with vehicle and the Control group treated with apomorphine. Significant apomorphine effects were also observed in the striatum. Across all three treatment groups, apomorphine administration was associated with decreased striatal DOPAC and increased DA content. Post hoc analyses indicate that the effects of apomorphine on striatal DA content were significant in both the Control and E2/WD groups, but not in the E2 group. DA turnover (DOPAC/DA ratio) for all brain regions examined is illustrated in Figure 6. * p < 0.05 as compared to the apomorphine-treated control group and saline-treated E2 group. ** p <0.05 saline-treated as compared to apomorphine-treated within treatment group. As above, two-way ANOVA indicated no significant effects of Treatment Group, Drug, or their interaction within the prefrontal cortex (Panel A). 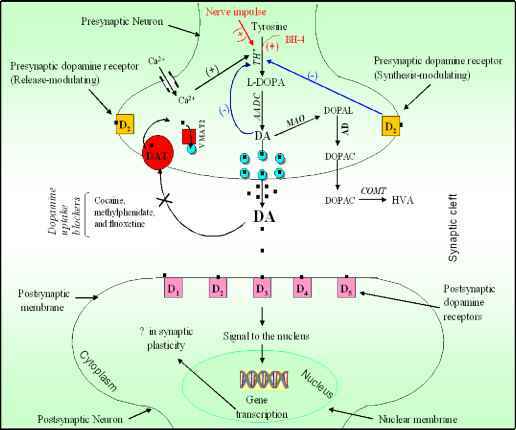 While no significant main effects or interactions were observed in the nucleus accumbens, it was clear that the groups were responding differently to apomorphine treatment (Panel B). Indeed, planned comparisons confirmed the expected reduction in DA turnover following apomorphine treatment in the Control group (t = -2.12, p < 0.05), while no effect of apomorphine on DA turnover was observed in either the E2 or E2/WD groups (both p's > 0.7). However, apomorphine produced a robust and consistent decrease in striatal DA turnover (Panel C). This effect (F[1,43] = 12.63, p < 0.001) reached significance in both the Control and E2/WD groups (both p's < 0.05). Figure 6. Effect of estradiol exposure and apomorphine treatment on forebrain DA turnover in rats. Data are mean (+SEM) DOPAC/dopamine ratio for prefrontal cortex (Panel A), nucleus accumbens (Panel B), and striatum (Panel C) for groups of 8-11 animals. * p < 0.05 vs. vehicle within Treatment Group.